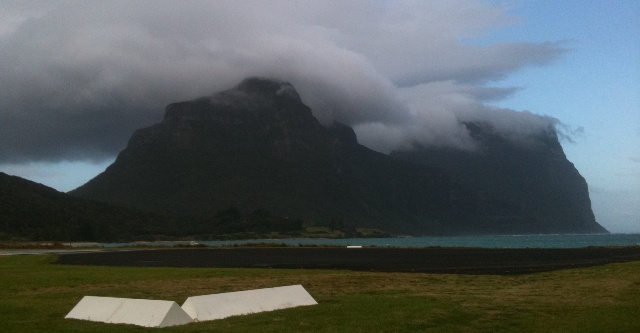 We’ve just landed at Lord Howe Island, 600km off Australia’s east coast. It’s a tiny speck on the ocean dominated by two enormous mountains, Mount Gower and ‘little bro’ Mt Lidgbird. EB points at the biggest one (in case I hadn’t noticed). I’ve been here before, back in the day with my parents, so I nod. Yep. That’s Mount Gower. We’re climbing it tomorrow, he informs me. I shudder the full length of my desk-fit body. Eight kilometres straight up. No, I say. EB looks at me incredulously. What do you mean no? I mean ‘never’. I’d love to, but I can’t do it. I just can’t. EB appears to agree, reluctantly booking in for the climb later in the week – on his own. He is ever the optimist. So, he leads me off cycling around the island, walking the trails, climbing every mountain. Except Mount Gower. Never Mount Gower. Way too early one morning, I’m on yet another path that hugs the spectacular rugged coastline. This one leads to the base of Mount Gower (Don’t even ask!). The walk is long enough for me to find comfort in a group where some find rock hopping challenging. Okay, I’m still nervous about the 8-plus km straight up, but I’m suddenly glad I decided to come. Imagine how annoyed I’d be with myself if EB returned and told me the group wasn’t made up of fearless fitness freaks and rangy mountain folk. Just people like me – excited, in a slightly hysterical way, but definitely more puffing than puffed up. 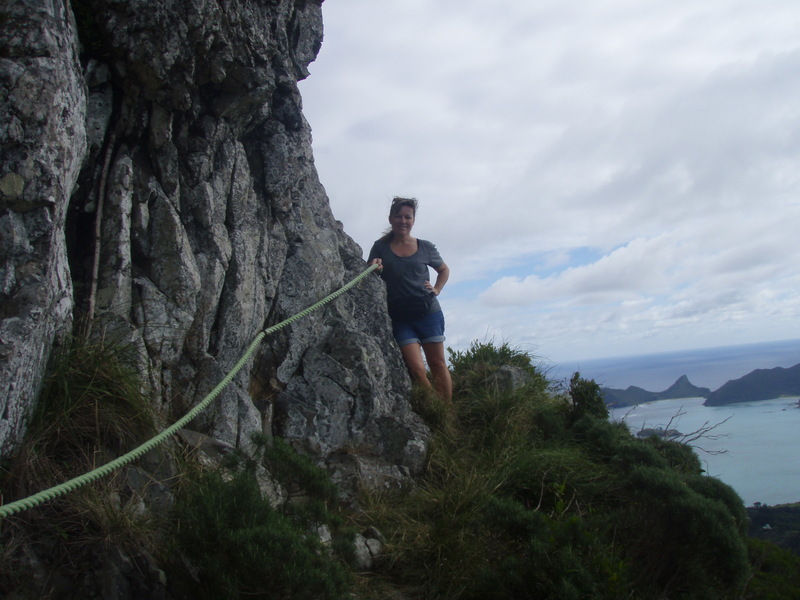 The rope-assisted climb begins and I’m remembering how much I love this walking-slash-scrambling up mountains thing, edging along narrow paths above sheer drops, challenging my fears (and yes, there’s nowhere to hide when EB knows this about me!). A few tough but amazing hours later, we reach the summit and find ourselves in a mystical forest where pathways made by wild creatures could just as easily lead you off the edge of the cliff. Our guide Jack Shick is a fifth generation Islander and third generation mountain guide. His passion for this place – and shimmying-up-palm-tree ability – is already obvious. But wait, there’s more. Jack points out some elegant birds, with wingspans slightly over a metre, gliding on the thermals high above us. Providence Petrels, he says. This is the only place they breed, and you can ‘call them down’. Yeah right. Then he starts making weird noises that sound suspiciously like mating calls. Suddenly one of these totally wild and extremely rare birds plops to the ground at Jack’s feet and fearlessly climbs into his hands. Then there’s a lot of serious plopping going on as several others land in awkward feathery bundles around us. Their landing ability may be severely lacking, but they have to be the extroverts of the bird world. They soon toddle off, unimpressed by the motley bunch of humans. So do we, back down to a sunny spot overlooking Mount Lidgbird. For me, there’s always a moment, on a walk like this, when I look back to where I’ve come from and feel stunned. How did my legs carry me that far or that high? Soon EB and I are sliding and scrambling down the mountain with two 13 year-old boys who have energy to burn (and yes, our well-honed parenting instincts are in full swing!). At the bottom there’s a lot of whoop-whooping going on (mostly in my head). Not just because it’s a fascinating climb or even because I conquered the mountain – but because I did something tougher. I faced down my fears. Except… all that learning maketh me peckish (and thirsty). Time for a celebratory bubbly and a very civilized dinner in the fabulous Pandanus restaurant. …and there’s still some walks we haven’t done yet. A ‘climb every mountain’ chorus line: It’s all here. Pick your grade – from 1-5. 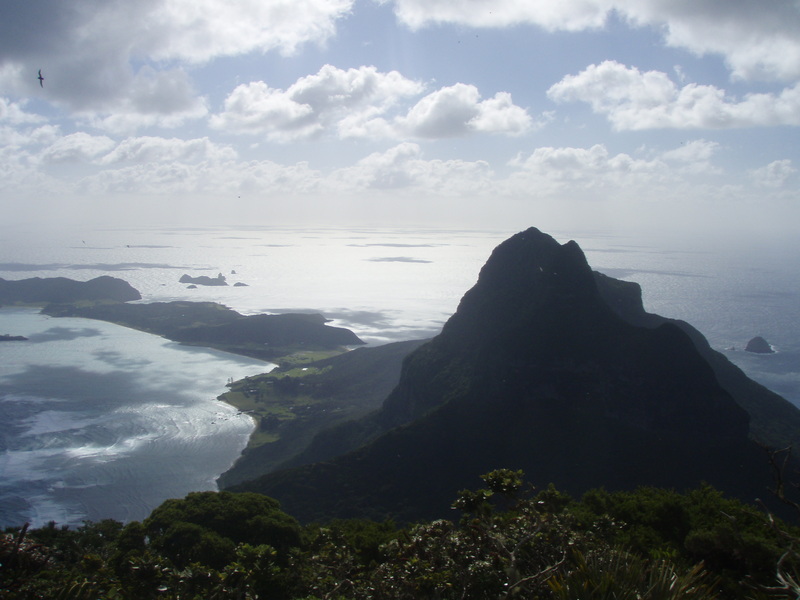 There is Transit Hill (2 km return), Malabar Hill and Kims Lookout (5 hours return), Goat House Cave (5 hours return and awesome), Mount Gower (8 hours return), Rocky Run and Boat Harbour, Intermediate Hill and more. (Note to self: next time, hide all maps from EB). This entry was posted on Friday, May 24th, 2013 at 10:23 pm	and tagged with Lord Howe Island, short breaks, travel, vacation and posted in Australia, short breaks, Trekking. You can follow any responses to this entry through the RSS 2.0 feed. Good for you – what a great experience! And to have petrels dropping at your feet to check you out – wow! You crack me up AW. Now I’m walking around saying “you don’t know Jack Schick” in a Top Gun accent [snicker].